Frome instrument maker, Tim Manning, has been busy making two performance-specific instruments commissioned by the world famous Bolshoi Ballet for ‘The Winters Tale’ ballet. The ballet was originally created in 2014 after William Shakespeare’s play of the same name for the Royal Ballet by Christopher Wheeldon, choreographer, and Joby Talbot, composer. Due to be performed for a first run of a week this April, The Bolshoi contacted the performer Greg Knowles, percussionist, with a view to purchasing instruments similar to those he used for several runs of the ballet in England and Australia. Greg Knowles introduced them to Frome instrument maker Tim Manning. Tim’s specialism is in making hammered dulcimers, a large family of instruments that predate piano and exist in different forms all round the world. The instruments required for the ballet are unusually featured on stage in all three acts. 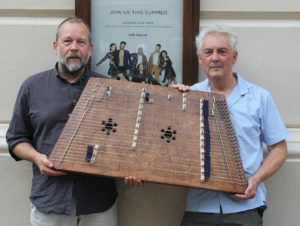 They have to be carried around whilst being played, and necessitated Tim developing two very lightweight instruments, one a version of a German dulcimer called a Hackbrett, the other a version of a Hungarian dulcimer called a Cimbalom. The Bolshoi Ballet, recognised as one of the foremost ballet companies in the world, is based at the Bolshoi Theatre in Moscow. Founded in 1776, it is among the world’s oldest ballet companies.